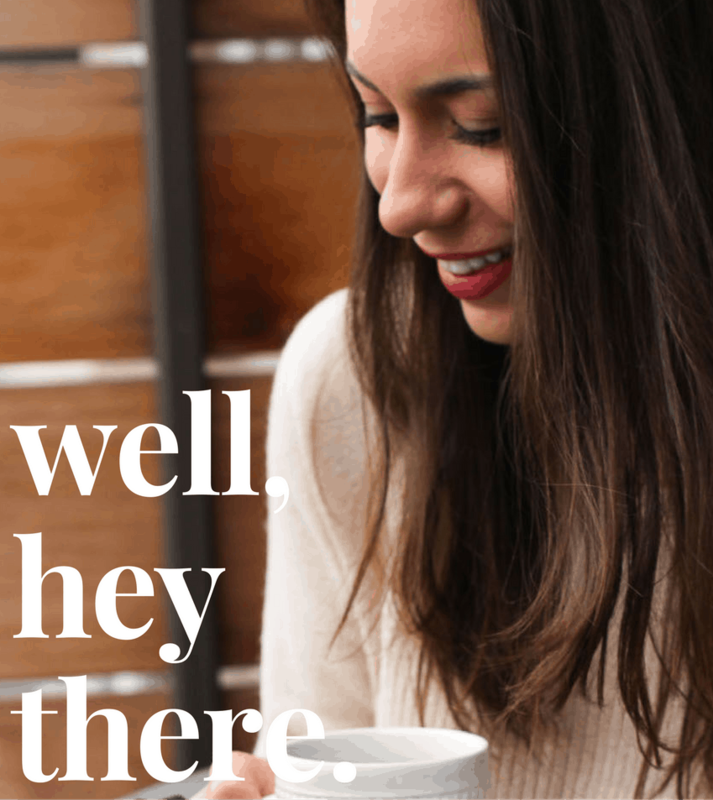 I think we all have foods or drinks that we closely associate with certain locations or experiences in our lives. The kind of thing where one bite or sip quickly brings up those memories. For instance, the Lime-A-Rita I had at an outdoor concert years ago is forever paired in my mind with summer fun with friends. To this day, RITAS are my outdoor concert drink of choice and bring back so many good memories just with the first sip! 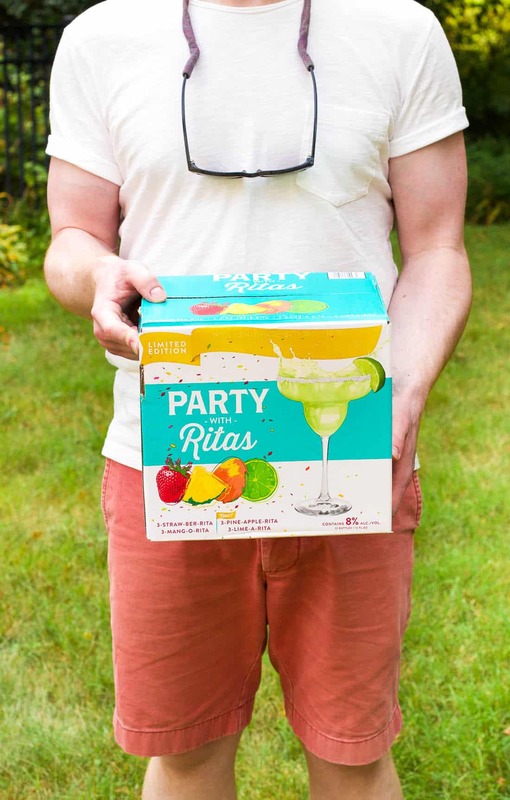 While summer concerts are prime time for drinking RITAS, the new Party Pack makes it easy to keep the good times rolling right in your backyard, on the beach, or wherever your summer entertaining takes you. What I *love* about the RITAS Party Pack is that there’s a flavor for everyone. 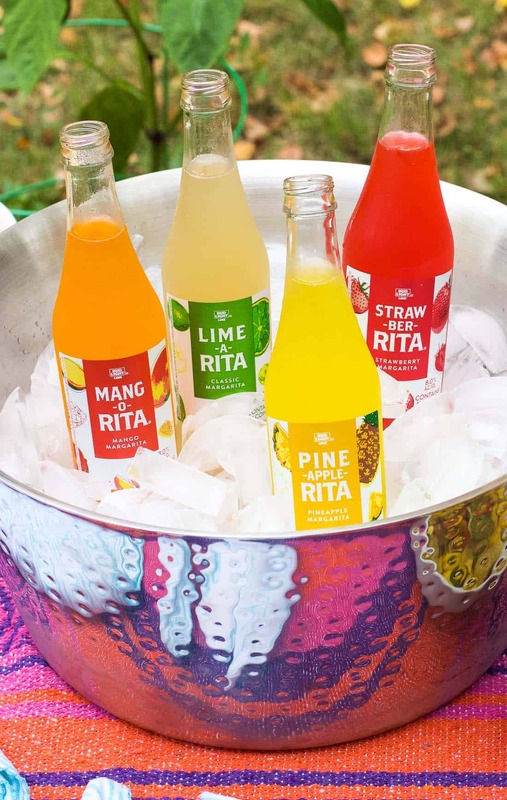 Fan favorites Lime-A-Rita, Straw-Ber-Rita, and Mang-O-Rita join brand new Pine-Apple-Rita in this delicious, fruity assortment. 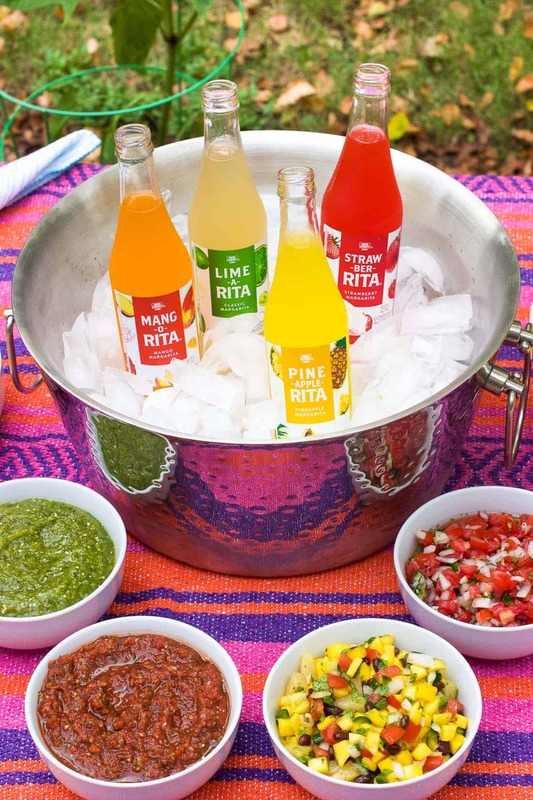 Having someone play bartender usually comes with the territory when hosting a party, but there’s no need with RITAS! 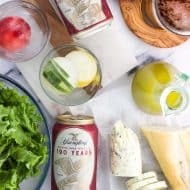 They’re the perfect drink to accompany BBQs, parties, and summer get-togethers with friends and are as easy to serve as cracking open a bottle. Truly a hassle-free way to enjoy a juicy flavored drink in a cinch. 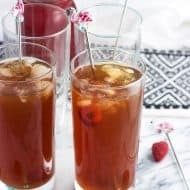 My summer entertaining style is to keep things simple, both with the drinks I serve and the food I make. 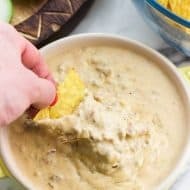 Since chips and salsa make a wonderfully complementary pairing with RITAS, I set out a DIY salsa bar for my guests to munch on when they grab a RITA. 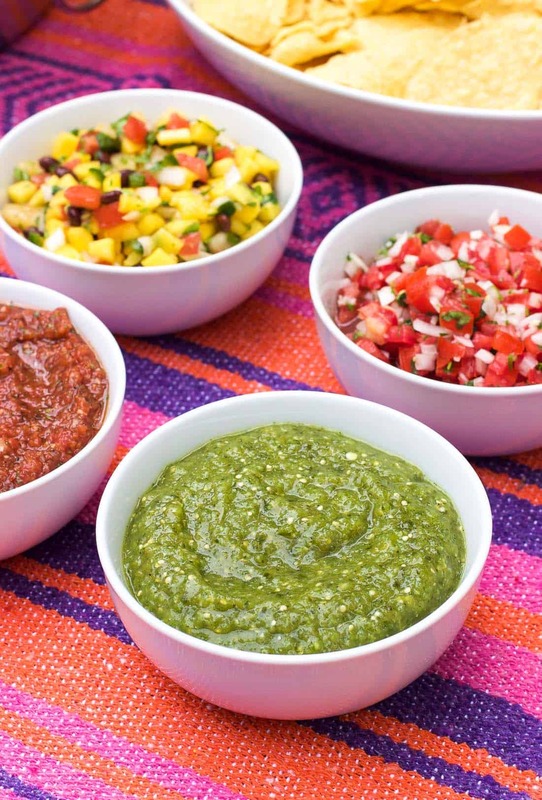 All four varieties of these salsas are homemade for a truly customizable salsa experience. 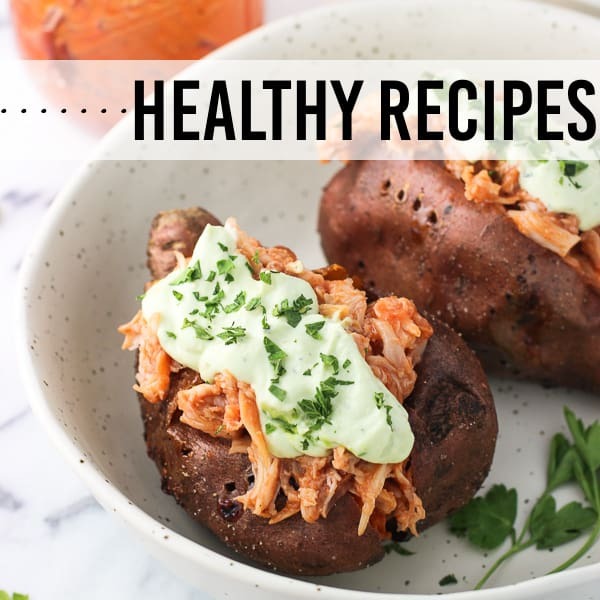 The good news is that they’re all able to made ahead of time, so you can prep/refrigerate the salsas and clean up the kitchen well in advance of guests arriving. Because we all have better things to do in the hours before throwing a party than washing a ton of dishes, right? 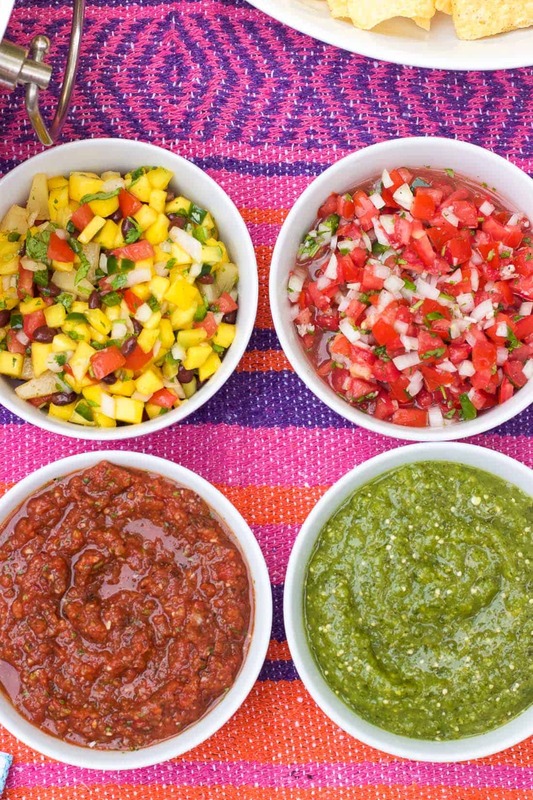 This salsa bar features four homemade salsas with varying levels of spiciness. See the notes and recipe card below for tips on how to adjust the spice level to fit your tastes. Two of the salsas (roasted poblano salsa verde and smoky adobo salsa) are blended, while the other two (pineapple mango black bean salsa and pico de gallo) are chunky, meaning just like with RITAS, there’ll be something for everyone. 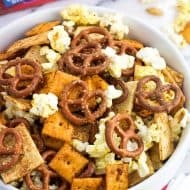 Before guests arrive, just set them out next to a few bowls of chips near the RITAS and your guests have a one-stop-shop for their party eats and drinks. 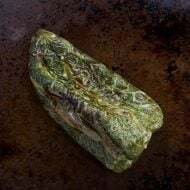 Roast the poblano peppers a day or two in advance, as they’ll keep well in the fridge. This is the easy method I use. I used the same food processor for both blended salsas, simply giving the bowl and blade a rinse between batches. This cuts down on the number of dishes to wash. 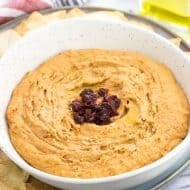 The ingredient list below looks a bit lengthy, but many of the ingredients are repeats between the different salsas (tomatoes, onions, garlic, cilantro, lime juice, salt and pepper). And of course, serve your chips and salsa bar alongside RITAS! The fruity flavors pair well with the spicy and bold notes in the salsa. This combo is sure to bring a fun and summery vibe to your backyard party. Who doesn’t love a contest? Take a picture of your Pine-Apple-Rita and post it to your social media with #ritascontest to be in the running to win a trip to Hawaii! Check out the official sweepstakes rules for more information. 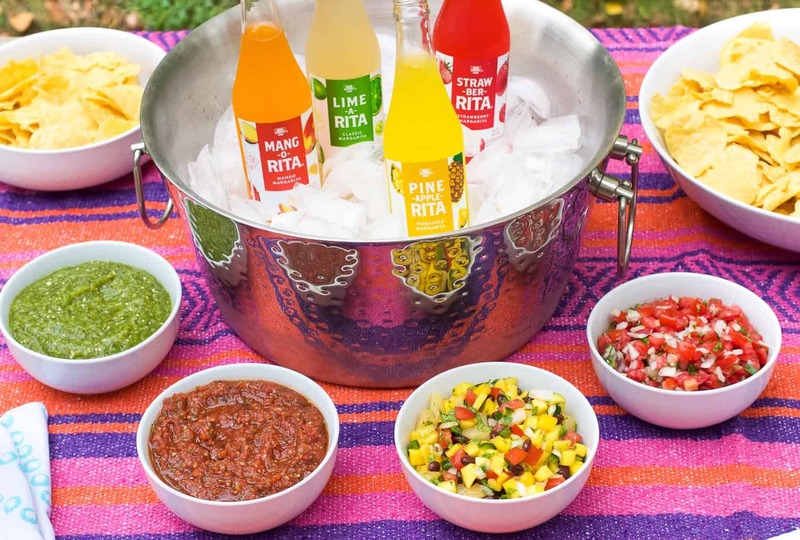 Check RITAS out on their social media channels (Instagram, Twitter, Facebook, Pinterest) for more summer entertaining inspiration! 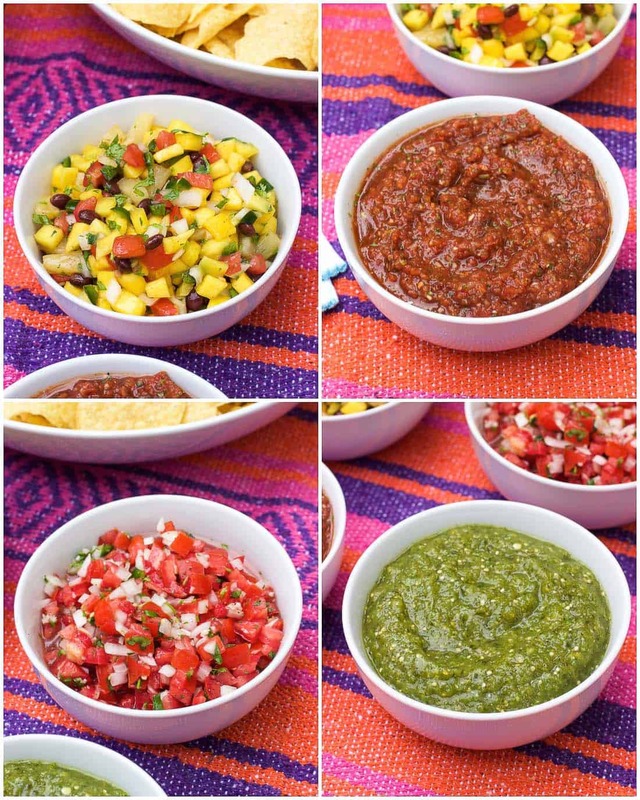 This DIY salsa bar is sure to impress your guests! 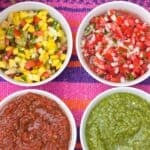 Featuring four make-ahead homemade salsas, this salsa bar can be customized just to your liking. 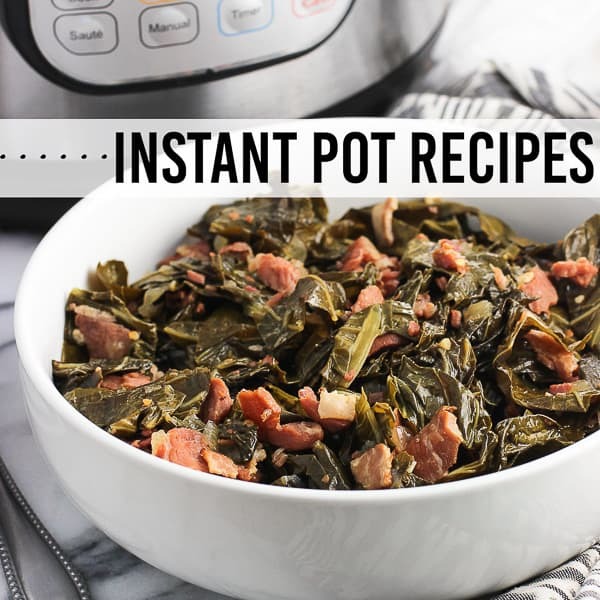 Stir together all ingredients in a bowl and season to taste with salt and pepper. 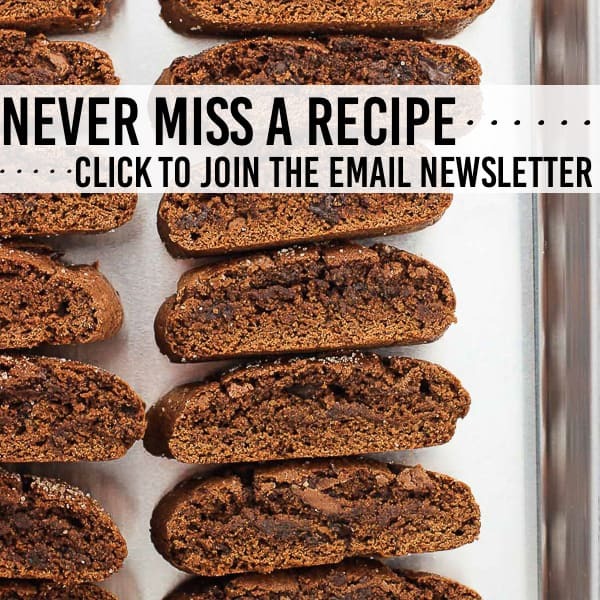 Refrigerate until serving. Add all ingredients to the bowl of a food processor and blend until mostly smooth. Refrigerate until serving. Arrange DIY salsa bar next to several bowls of chips. 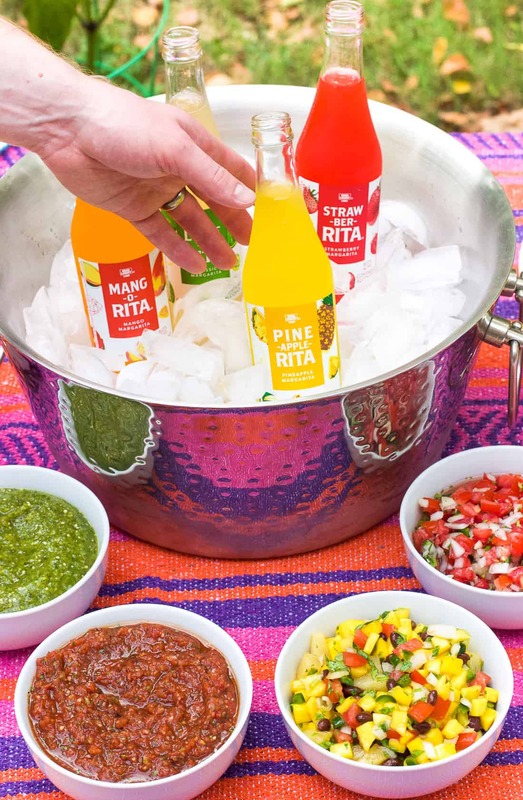 Serve alongside the new RITAS Party Pack for a perfect summer entertaining pairing! Pico de Gallo: This is pretty mild as written. Omit the jalapeño for no spice, or leave the seeds in (and/or add more jalapeños) if you like this spicy. Roasted Poblano Salsa Verde: This is just a little bit spicy from including the jalapeño seeds. The poblanos bring more of a smoky flavor than spice as a jalapeño or serrano pepper would. Leave out the jalapeño seeds if you'd like less of a zip. Smoky Adobo Salsa: This is fairly spicy, with the spice coming from the chipotle peppers in adobo. Use one pepper instead of two to make this salsa less spicy. Pineapple Mango Black Bean Salsa: This is spicy. Leave out the jalapeño seeds if you don't want it as spicy, or add more if you like. If you're really into spice, try adding some of a serrano pepper as well.